Fresh off the easel. I just finished this large painting but I wasn’t sure if it was done. I had a feeling that the missing ingredient might be the frame. It’s unusual in it’s shape and composition and I thought that a frame might contain and clarify the composition. Luckily Chris, my wife, who makes my frames came up with a great solution. She used American black walnut on this which is a little darker and has a more subtle grain than the usual quartered oak that she prefers for larger works. This keeps your eye in the painting and entices you to consider what exactly is around that river bend? I suppose that was the point of the painting from it’s original sketch. This piece is fairly wide. 24 x 48 inches framed. 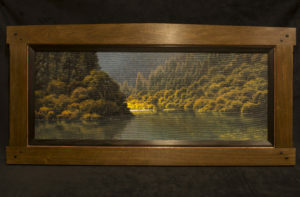 It will be around for a short while before it finds a home – I envision it going to a fisherman or perhaps will find a place on the wall of a beautiful cabin on a lake or river. $7200.